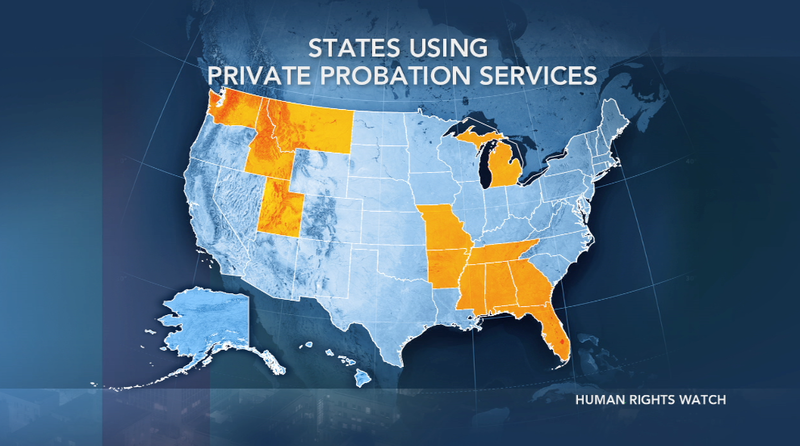 Al Jazeera has a must-read report on the rise of for-profit probation companies — an often under-reported sector of the prison industrial complex. Because lower-income people are most often the ones who cannot pay, they are the ones who bear the brunt of this injustice. It’s a new breed of the collections agencies that have locked people in poverty for generations — except this time its within the purview of law enforcement. The article tells the story of Elvis Mann, a 55-year old black veteran from Alabama who became indebted to Judicial Correction Services, Inc. (JCS) after he was issued an estimated $300 citation in 2006 for driving without a valid license. But rather than actually helping him pay off his debt, JCS put Mann on a course to further destitution and hardship, increasing the amount of money he owed and the number of people he owed it to. In addition to the ‘monthly supervision fees’ he had to pay, JCS dug into his past record and assumed control of other fines, too. He quickly went from owing $300 to owing $9,000. This makes no sense, of course. Mann was sent to JCS because he could not pay a $300 citation in the first place and he now faced an even more-insurmountable debt. JCS got a court to issue a warrant for Mann’s arrest and imprison him for 30 days. Mann told reporters that, on a separate occasion, JCS told him that “if he didn’t pay $600 by the end of the day the town would lock him up again.” Kafka laughed. This is without a doubt a form of debtor’s prison. It is apparent that private probation companies are, by virtue of their profit structure, not driven by a desire to rehabilitate and keep people out of prisons. Private profits dictate that companies like JCS do the exact opposite: keep offenders locked in a cycle of debt while securing more contracts to take on more probation cases from the courts. If the individual can pay JCS off and escape their clutches, it’s a lost business opportunity. JCS knows this, and exploits the offender’s fear of incarceration to extract more money from them. JCS cannot have people arrested on its own for failing to pay their debts — it relies on the courts to provide warrants. But people who owe JCS money often don’t know or understand that. Untying this section of the for-profit corrections’ gordian knot is particularly complicated. Unlike other for-profit corrections companies, JCS doesn’t take a dime from taxpayers. It appears as though it’s millions in annual revenue come entirely from the population it purports to serve, through those insidious ‘supervision fees’ which are interest charges by another name. This shifting of the burden from society-at-large to the individual could reduce the number of concerned citizens willing to speak out on their behalf. Without such a clear social investment in the problem, some might wonder why they should care. As is true for the prison abolition movement as a whole, combating this indifference is essential and requires serious public education. It requires the raising of awareness of an unjust, New Jim Crow system that implicitly denies certain parts of the population their freedom (the brown and poor) by virtue of their birth. It also requires a severe deconstruction of the crime and punishment myths that pervade American culture, justify prisons and vilify prisoners. It requires real-life examples of theory-versus-practice in matters of justice and law enforcement, such as the case of Elvis Mann. It requires intersectional approaches with other debt struggles like those surrounding student debt, housing and employment. What JCS and other for-profit companies do cannot rightly be considered ‘probation.’ They have not built a system that helps offenders make payments and stay out of jail in ways the state cannot. JCS makes money off the individual’s inability to pay, and they have created a lucrative gyre of debt that threatens financial ruin and incarceration for people who actually need help the most.